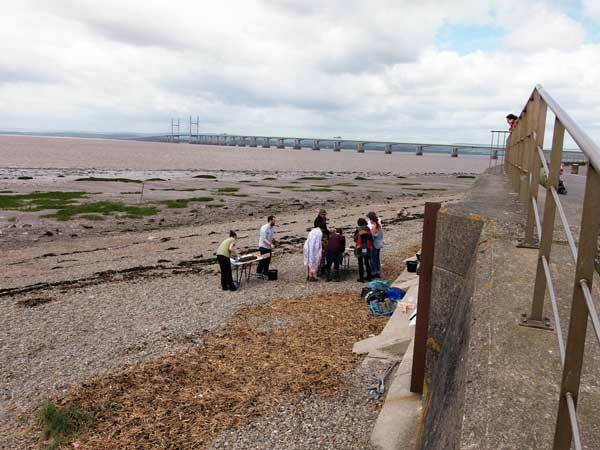 ‘Into the Mud’ (21 June 2015) was an outdoor workshop organised by Marianna Dudley, from the University of Bristol’s Department of Historical Studies as part of a collaboration between ‘The Power and the Water’ and ‘Towards Hydrocitizenship’ projects, funded by the Arts and Humanities Research Council’s Connected Communities Summer Festival. Artist Tana West ran the workshop which used clay extracted from the Severn riverbed at Aust. Tana is interested in exploring the intersections between nature and culture by using materials at hand. The location, at Severn Beach, was ideal to work creatively with mud from the river and to make connections between object, processes, origin and materials, by creating a temporary manufacturing base on the riverbank. Here, two workshop participants, Mireia Bes and Ana Miguel, reflect on why they attended the workshop and how it has changed their understanding of, and relationship with, rivers. Mireia: I found out about this event at Festival of Nature and immediately decided to join. I’ve been doing pottery since I was a kid, but I rarely have the chance to do pottery with clay that comes directly from the landscape, it was always detached from my surroundings. There´s something quite primal about sourcing your own clay and doing pottery on the spot that really attracted me. Ana: I found it fascinating as it brought together some of my passions: research, the environment and pottery. My experience with academia and the university has been through a formal approach of seminars and lectures. In this case, the location, format, material and topic were integrated in an innovative fashion. We engaged in a natural and relaxed way which allowed us to increase our creativity. Pottery is a recent discovery in my life. It allows me to connect with my creative side and disconnect from the daily life. I loved the idea to be outdoors with clay in my hands from the mud of the river. 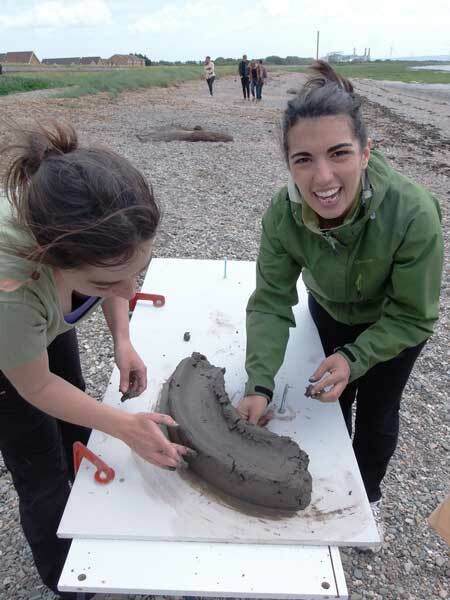 Mireia: It was a luxury to be doing pottery at Severn Beach. The mix of the natural landscape left behind by the tide with the industrial buildings and the lack of people despite the sunny day, gave it a bit of a dystopian feel. For me the actual trip there, was as interesting as the final destination. Leaving the centre of Bristol and seeing a new landscape emerge and change until we got there. Sometimes we just jump into a train and get out at the final destination without even paying attention to the landscapes we see through the window. I had the chance to share the trip with Peter Coates who told me about the history of the area and that totally changed the experience, I felt I was more connected to that landscape. Ana: The bank of the river Severn was the perfect location for this workshop. We were in the Severn Estuary which is one of the biggest estuaries in Europe. It was an impressive location: we could see the windmills and a really long bridge. The colour of the water is brown which created a real connection with the mud. We were surrounded by mud and different varieties of algae. For me one of the most important aspects was the (de)contextualisation of the workshop. When I think about a pottery class, the image is of a room indoors. However, ‘Into the Mud’ was an outdoor workshop. We were surrounded by the origins of the clay, working with mud from the river and learning about the environment. Being in this new location generated an atmosphere, relationships and conversation completely different from a normal class. Mireia: The clay actually came from Aust and it was there when we arrived, which was a relief as I didn´t have wellies! It was funny to work with that clay because it has a different texture. It was interesting to change this idea of the clay as something that comes in a bag for you ready to use to something that you can actually source from nature and work it to transform it into objects. We were also constructing something together, working as a group, which is not something that usually happens in a pottery studio. Ana: Being so close to the clay’s origins connected me more with the environmental aspect of pottery. I have never thought before about the relevance of where the clay comes from and also that it was so easy to get clay from natural resources near me. We used the mud from the river to construct a waterpipe. We also used some objects around us to work with the clay such as algae or plastics. A key aspect in this process was that the researchers from the ‘Power and the Water’ project were explaining us the history of river Severn, the landscape and the connection with their projects. We took some clay/mud to our pottery class, but all of a sudden it was decontextualized: it smelled and it felt wetter and stickier than when we used it on the beach. Our fellow potters didn’t really engage with the new material… but Mireia and I will use it anyway, we now have a special connection with this material. Mireia: I really like cities that have rivers because I feel they create spaces for social interactions and connect you with other lands and people that the same water will touch. Obviously rivers are very important from an ecological point of view and for the societies that grow around them, but at a personal level I had never experienced a direct interaction where the river was actually providing me with something that then I could transform into an object that could have a function in my day to day life. It was a new way to look at rivers. Ana: My main contact with rivers has always been from tourism and leisure. I have enjoyed the rivers with activities like canoeing or having a bathe. Another aspect of my relationship with rivers is from the point of view of the lack of water. Coming from a country [Spain] where we experience frequent droughts, I have experienced water cuts and the close monitoring of water levels in rivers and reservoirs in the weather forecast. This generates a completely different relationship with water than someone could have in England, for example, where there is a lot of rain, water and recent problems with floods. Since I have been living in England, for four years now, my relationship with water and rivers has been transformed. As a result of the day we learnt things about pottery, history and landscape, and the relationships amongst those. But most of all it was a reminder on how important it is to create spaces to have proper conversations with people and how much you can learn from those. All of us had something to say about water and our relationship with it. We really valued the opportunity to learn about the research that is taking place at the University through a workshop like that. Research is usually presented in a more formal way such as lectures or seminars and it is more difficult for the public to access. We also felt that the collaboration with other disciplines, an artist in this case, was key for us to engage with the research in a meaningful way through a practice that is relevant to our lives. It offered an opportunity to experiment, collaborate and learn in a relaxed way. Though I’ve lived in Bristol for almost a quarter of a century, participation in this outdoor workshop marked only my third visit to Severn Beach (which is particularly lamentable given that there’s a station on the rail line from Bristol Temple Meads to Severn Beach just two minutes from where I live). I was there for the first time shortly after the new bridge (second Severn Crossing) opened in 1996, thirty years after the first bridge. The main aim was to walk under the bridge that carries the M4 into Wales, and my attention was focused more on the technological sublime of the crossing itself than on what was being crossed. My second visit came in January 2008, as part of an AHRC ‘Landscape and Environment’ Programme Research Network, ‘Living in a Material World: A Cross-Disciplinary, Location-Based Enquiry into the Performativity of Emptiness’. On that occasion, we explored the remnants of the old seaside resort and wandered across the mudflats at low tide, before trudging back to our base, the Royal Avonmouth Hotel. But this most recent visit – because of the nature of the activity – provided the most concentrated exposure to the primordial muddy identity of Severn Beach. Tana’s workshop was not only location-based but location-dependent, a patch of pebbly foreshore temporarily transformed into a workscape. The bridge was firmly in the background and the foreground was the brownscape of the estuary. As the first photo accompanying the blog underlines, there’s little difference in colour between the water and the tidal flats, which merge together almost imperceptibly, separated only by the slight milkiness of frothy wave. Like Ana and Mireia, I also took a couple of surplus cow patties of mud away with me. Preserved in a Ziploc bag, they’re lumped, de-contextualized, on a shelf in my office. Heavy and moist, I press them with my fingers at least once a day, to re-connect with that fertile, mid-summer’s afternoon brownscape.